We are proud to introduce our new release of dhtmlxGantt: the version 5.1. It brings you such long-awaited features as resource planning and ability to use right-to-left mode. Continue reading to learn everything about the update. The possibility of resource management is quite critical for many projects because it helps to estimate not only a total load of a project, but its parts and load of each resource separately. When we talk about resources, we mean people, equipment, money, etc. In project management and gantt chart software in particular, the resources are mostly considered to be human resources, that’s why we’ve prepared some suitable examples for this case. 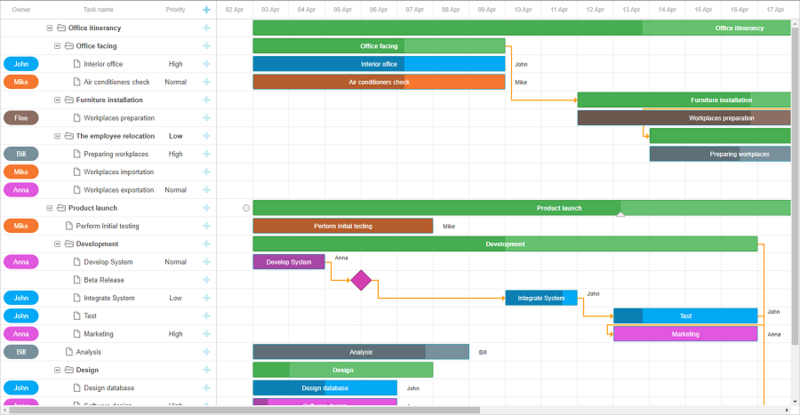 As the gantt chart resource diagrams clearly demonstrate the total load of people and projects, it’ll be simple for the end users of you app to balance the resources load and manage the projects more efficiently. Using resources diagram in dhtmlxGantt, you can show such information as completeness, workload, capacity for each resource. Note that the resources management in dhtmlxGantt is available in Professional Edition only. For now, you can assign one resource per one task. We’re planning to add the ability to split the task between multiple resources in future updates, so stay tuned. Starting from the version 5.1, dhtmlxGantt can be displayed in the right-to-left mode. 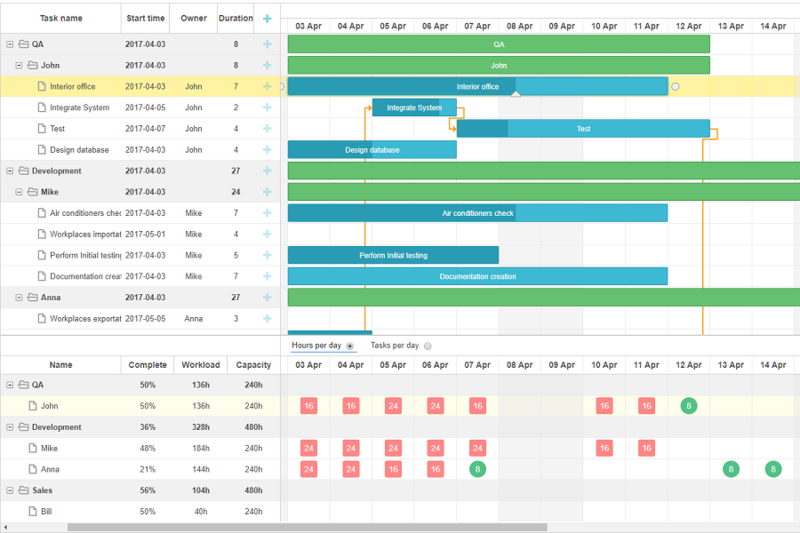 All the elements of the gantt chart including a time scale, grid columns, tasks and dates can now start from the right part of the page and continue to the left. The previous versions of dhtmlxGantt didn’t have a destructor method since usually the Gantt instance lives the whole lifetime of the page where it’s displayed. It’s not a problem by itself, but when we’re using dhtmlxGantt together with modern frameworks like Angular or React, we have to remember about it since the gantt instance couldn’t be destroyed together with its parent component. Thus, this is a small feature that will allow you to use dhtmlxGantt together with modular frameworks in a more intuitive way. Find out more in our documentation. In dhtmlxGantt 5.1, we’ve added many new options and removed some redundancy in the layout config, so your configuration code will be simpler and more powerful at the same time. One of most noticeable update is the ability to have an inner horizontal scroll in a lefthand grid. It allows you to place as many columns as you need. You often ask about the ability to install the PRO edition via npm. While we still don’t provide a private npm feeds for PRO versions of the component, the package now includes package.json file which allows installing it as a npm module locally. Read some useful information about all possible ways of npm installing dhtmlxGantt PRO here. We hope you enjoy the update! Let us know about your opinion in the comments section below. The first samples link to 404 page. We’ve just fixed the link. Thank you! – add it to one of the scheduled release sets on the roadmap? This update is critical to my company. Finally, in the meantime, is there any workaround you can suggest? We haven’t added it to the roadmap yet, but it probably will go to the update after the upcoming one. As the feature description – we’ll add a new type of entity to the dhtmlxGantt chart – resource assignment – which will allow many-to-many relations between tasks and resources and will store some assignment info (e.g. the amount of required resource in some form). Together with introducing the different kinds of resources – work/material/cost – it should allow more powerful resource management. But it is still in a planning stage, so we can’t provide you more details. As for the solution right now – unfortunately, there is no simple way to implement this. Theoretically, such feature can be added manually, but it will require some amount of research and development. Thanks for your quick reply. Indeed we may have to implement an extension of dhtmlxGantt 5.1 for this purpose in the meantime so we’ll carefully consider ” many-to-many relations between tasks and resources [which] will store some assignment info (e.g. the amount of required resource in some form) ” …and a way to display the resulting info, which seems to be (to my mind) the most challenging part!